Right. 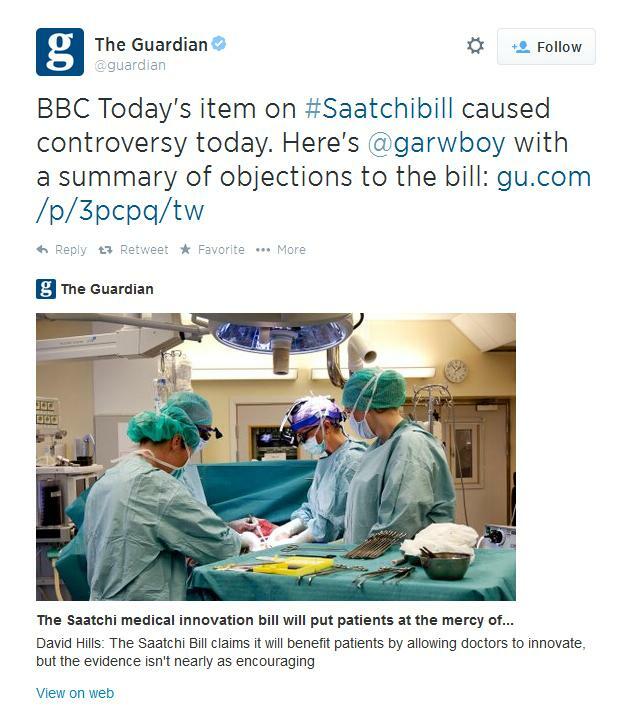 Back to the Saatchi Bill again. The bill opens patients up to the risk of mistreatment by negligent, incompetent or quack doctors, by removing patient protection against such mistreatment. The bill cannot be used for research purposes, which seriously undermines supporters’ claims that passing this bill will result in a cure for cancer and other serious diseases. Dominic Nutt, the director of communications for the Medical Innovation Bill said: “On Thursday, the new, leaner, cleaner Bill, steeled in the furnace of vociferous public debate, will be presented in the House of Lords. I’m going to show here that the problems are not fixed, and that the bill is just as bad as ever. This post will concentrate on responsible treatment, the next on research. The new bill, although embedded in a 42 page “briefing note” that attempts to justify the need for it, is itself very short, only 1½ pages. As the briefing admits, the explanatory notes are not part of the bill and they are not endorsed by Parliament. It’s those 1½ pages that we must read and understand if we are to know what the bill will do if it is passed. Let’s take this a line at a time. 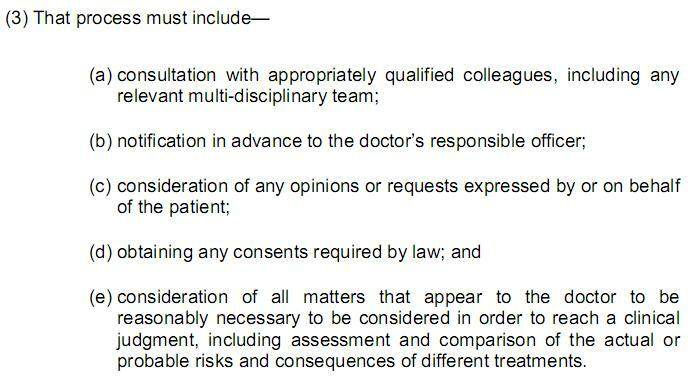 The first sentence, (a), requires consultation with appropriately qualified colleagues, but it does not require the agreement of those colleagues. It does not say who those colleagues should be, anything about what suitably qualified means, about their standing or their independence. It doesn’t even require the existence of a multi-disciplinary team at all, only that if such a team exists they may be consulted if it is relevant to do so. Who decides if it is relevant? So what we have is no protection against a puppet multi-disciplinary team, or a team that is not competent to advise. We have no requirement that a team even exists, and even if it does exist, is competent and is independent, and is considered relevant by the doctor, even then the doctor is free to ignore their advice. Onto (b). I’m not fully familiar with the role of responsible officers, their duties and powers, but I have seen comment from those who know this area well that there are concerns about making ROs part of this process. In any case, the doctor only needs to notify their responsible officer that they are planning to undertake an innovative treatment. There seems to be no provision here for the RO to be able to act as a brake on dangerous practice, and some doctors may not, as far as I know, have an RO as such. Now (c) and (d). The patient is unlikely to be in a position to be able to assess whether the proposed treatment is a responsible innovation. They are unlikely to be medically qualified, and if the treatment genuinely is novel, there is no background research they can do. Also, the patient is at a disadvantage. I’ve covered this before, but basically an ill and desperate patient is unlikely to be a dispassionate assessor of the advisability of their own treatment. The patient must be consulted, they must be free to take a full role in determining their own treatment path, but they cannot be put in the position of having to be the mechanism that protects them from exploitation at what could be the most vulnerable point in their life. And then (e), which in essence states that the doctor can consider anything else they feel they should consider. The decision on this is entirely in their hands. This line in itself is clearly no requirement to consider anything else at all before undertaking treatment. In short, as succinctly put by @PencilBloke on Twitter, the bill doesn’t remove the Bolam test for responsible treatment, it simply removes the need for a doctor to be able to pass it. Not so, Mr. Nutt. Not so. So, having dispensed with the idea that the wording of the bill forces only responsible innovation, what are the likely effects if it passes into law? Well, obviously, it’s open season for quacks and the incompetent. And not just for cases where there is no existing treatment available. Inexplicably, the bill does not even make a passing attempt to limit its use only to such cases, so there is nothing to stop private clinics from springing up to offer a whole range of “alternatives” to existing effective treatments. I’ve also mentioned in my first piece on the bill how I think it would be an invitation to pharmaceutical companies to push orphan and indifferent drugs. This could potentially make them billions, possibly at the expense of other, more effective treatments. So much for protection against irresponsible treatment, then. My next post will look at the research side. Surely there’s some hope for the bill there?